When I started this, we were all enjoying something of an Indian Summer – certainly no sign of rain to help fill the lake for the over 50 RS Aeros already entered for their Inlands this weekend. As I am finishing it, the forecast for tomorrow (Saturday) looks unsailable with gusts in excess of 40 knots! What a change in a week! The Topper Training and Open weekend – 22nd/23rd Sep 2018, saw a mixed bag of weather. The forecast for the open on Sunday was initially so extreme that cancelling it altogether was considered. Thankfully the meeting went ahead in a lovely 10-15 knot North-westerly breeze. Sadly the forecast affected the entries but still 35 young sailors had a great, varied day of racing. In the morning it was decidedly chilly so race officer, Claire Jefferis, opted to do two races, then in for lunch, and two more in the afternoon. (Rather than 4 back to back). This gave Rob in the galley an unexpectedly busy lunchtime but, as usual, he rose to the challenge and fed everyone! The overall winner was Ollie Wilcox from Paignton, followed by Ben Richardson from Castle Cove. Chew’s highest placed sailor was Giles Griffith in 14th place. 17 lake & cake ladies (including a few partners) went on an away weekend to Weymouth at the end of September. The overnight accommodation was in RYA Portland House (purpose built for the British Sailing team at the 2012 Olympics) which overlooked Portland Harbour & Weymouth. 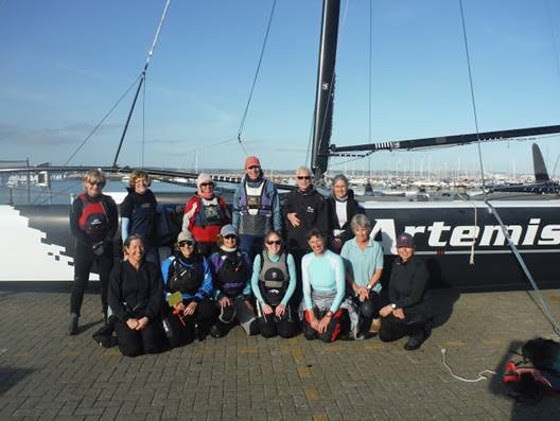 There was sailing on the Saturday with the Andrew Simpson Watersports Centre, and they sailed all day in & around Portland Harbour & Weymouth Bay, swapping between a range of boats (Aero, Lasers, Topper Topaz, Bahia, RS Ventures. The 29er was left solely to Pete & Anna!). The weather was the ‘star’ of the weekend – with wall to wall sunshine and it was hot. There was a get-together on Saturday evening in a pub next to Chesil beach watching the sunset and enjoying great food & company. To finish off on Sunday some went for a walk on Portland Bill, and one energetic couple (Sian & Muir) completed the entire circular walk. Judging by the comments I think they will be going again next year….‘a fabulous weekend’, ‘the best sail this year,’ ‘I enjoyed every minute of it’, ‘glorious weather and best of all a really great group of people’. This was (sadly) the last lake & cake of 2018, and for the first time the weather did not play ball – there were strong winds, rain and a shocking 7°C. But this did not deter Helen & Cathy from sailing. The rest of the ladies wrapped up & went for a walk instead as some activity had to be justified to warrant the cakes afterwards. The hot sticky toffee pudding did not disappoint! Chris has suggested that Saturday 20th October would be a suitable date for the next talk and demonstration, which will be on Splicing ropes. Start time will be 11 a.m. in the Clubhouse. Please join the group – Chris has a way of making any activity fun. If you want to avoid Tom Skailes’ wrath because you have missed a duty, make sure you have signed in the Duty Book on the OODs desk. No signature implies you are a ‘no show’. Our gallant caterer, Rob Hatherell, has put a suggestion book on display in the galley for us all to give him our thoughts about what we would like him to cook! Don’t just let your tummy rumble – make some suggestions! Membership Secretary – Rosie Bowers – Laser, Wanderer and Lake and Cake supremo! A.N. Other – volunteers please – contact Tom or Helen for details. New Members Rep. – Anna Mason, “I’ll try anything – 29er, America’s Cup boat”, mostly can be found in a blue Laser. AND we are still on the hunt for a Social Secretary; I could tell so many of you at the AGM were on the point of volunteering……. Many thanks to all the retiring officers – we do appreciate all your hard work. LAST OF ALL – I VISITED THE CLUB THIS AFTERNOON AND COULD BARELY STAND UP AGAINST THE WIND! Bristol Water’s large fish hatchery net had broken free from its mooring and landed on our concrete beach along with a lonely fishing boat. Many of our precious galleons have been blown over – I have tried to contact several of the owners. PLEASE remember to tie your boats securely down; for many without tie downs, it was only the gallons of accumulated water in the boats and covers which was keeping them upright! Covers also had taken a battering. I would suggest an urgent visit to the Club to check on your nautical investments….